CASH : your business needs to keep an eye in every penny, but you also need to make sure you continue to get your message out there. Marketing is a vital part of business; no matter what business you're in. Your marketing choices are almost infinite; there are virtually millions of options for you to get your message out to your customers. A simple choice is the good old reusable bag. 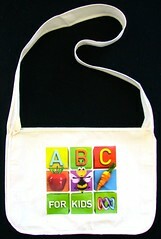 Bag People make it really easy to get your message directly to your customers. We help you with the style & fabric options that will suit your target market. We help you with your artwork preparation. We help you with the entire production & delivery process. Contact Us to find out how we can help you?